Khrushchev's 1959 trip across America was one of the strangest exercises in international diplomacy ever conducted. Khrushchev told jokes, threw tantrums, sparked a riot in a San Francisco supermarket, wowed the coeds in a home economics class in Iowa, and ogled Shirley MacLaine as she filmed a dance scene in Can-Can. He befriended and offended a cast of characters including Nelson Rockefeller, Richard Nixon, Eleanor Roosevelt, Elizabeth Taylor, and Marilyn Monroe. 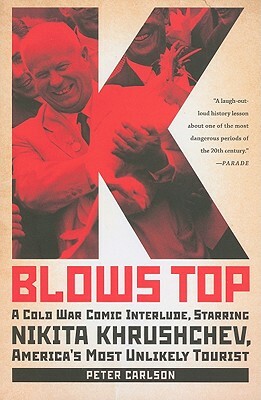 K Blows Top is a work of history that reads like a Vonnegut novel. This cantankerous communist's road trip took place against the backdrop of the fifties in America, with the shadow of the hydrogen bomb hanging over his visit like the Sword of Damocles. As Khrushchev kept reminding people, he was a hot-tempered man who possessed the power to incinerate America. Peter Carlson is a former feature writer and columnist for The Washington Post, where he wrote the column The Magazine Reader.” The author of Roughneck: The Life and Times of Big Bill Haywood, and a co-author--with Hunter S. Thompson and George Plimpton, among others--of The Gospel According to ESPN, he lives in Rockville, MD.